Many people are making use of side tap or edge tape to protect their table tennis racket from getting damage. As a professional racket can be very expensive for the price, it is best to use such edge banding tape to provide extra care for the racket so that it can last for a longer period. As there are many edge banding protectors available in the market, it is rather easy for you to get one if you are looking for such tape. However, there are many people who not really know how to put the tape on the racket. Some are affixed themselves but been getting frustrated and loss of patient since the process is required a certain skill. If you are facing problem to put on the side tape cloth nicely on your racket, you may want to figure out how to do so with less effort and less time being consumed. How To Use Edge Tape? Do You Really Need Edge Tape? Firstly, you need to know that the edge of table tennis racket edge is not sticky adhesive and it is usually pasted with professional protection edge tape. Thus, it can make the racket to withstand with knocking and falling on the floor. In addition, professional edge tape is also made of very lightweight and features with a beautiful outlook with cheap price. The way to make use it for additional protection: the edge tape is having a layer of stickers (plastic film holding the rubber surface). You may simply remove the protective film, expose the sticker, paste it on the edge of the racket( is best for you to clean the edge of the racket prior for this), and finally cut off the redundant part. You are done! As the name of edge protection tape suggests, it is of course to protect the racket. This is due to sometimes when playing the game, it is easy to make a “close contact” with the table, or sometimes you may lose the hand and have your racket fall to the ground. Thus, this is the time you will find edge tape is very useful to provide great protection for your racket. While some players are putting on the edge tape with the purpose to counterweight the racket or make the racket to be thicker. And that the protection of the edge is conducive or destructive for game playing is of no uniform argument, it completely depends on personal habits! While some players are doing so just because they think this makes the racket look more beautiful! Of course, if he/she is good in pasting tape. Because for those who are not used to it, sometimes cut their own rubber, affix the tape can make the racket turn out to look really ugly! You can also wrap it with glue which is the old way of doing the thing. There are a lot of different glues that you can use for this purpose. As of now, most of the suppliers will give you the edge protector when you are buying the racket, therefore, now become very fewer people who still wrap their rackets with the use of black or white tape. Of course, you can paste with a black sticker. you can paste any of your favorite colors as long as you like it. But one important reminder that you need to bear in mind is that, once you paste the edge tape on your racket, peel it down and get the edge clean can be very troublesome for you to carry out! Some tapes will provide you with great resistance for direct impact on table tennis table but may not protect your racket against scratch. Some may easily be torn and can even make an impact directly to the blade. While some tapes can provide you with great resistance for scratch and didn’t tear off easily. However, some of the force itself may dent the wood. So the tension from outer tape will further help and you may take this into consideration as well. This is a roll of side tape from Yasaka to protect the racket’s edge. It protects the racket from hitting the table as well as gives good balance. One roll can be used for 10 standard size rackets. The width is 10mm. You can buy this tape from Megaspin. This is one of the best-seller tapes from Butterfly. 1 roll of the side tape is having a width of 12mm and a total length of 10 meters. It can use to roll for about 20 rackets. 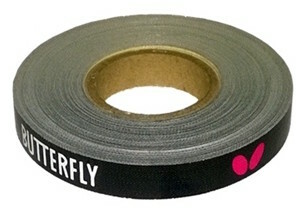 You can get this tape in 3 colors which are black, white, or magenta. The color is clear and is very sticky. Most people are in love with this side tape because of its quality. This tape is available at Megaspin. 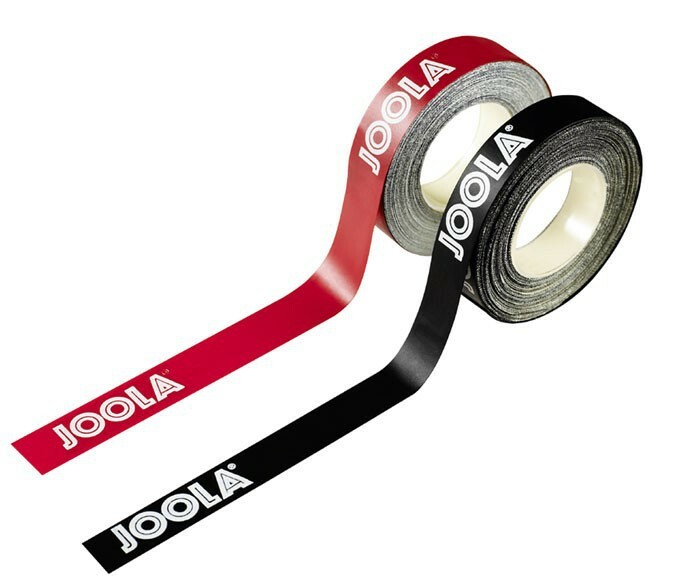 This is a large roll of edge tape from JOOLA. 1 roll is having a width of 10mm and a total length of 50 meters. It can be used to cover for about 100 rackets. There are 2 colors you can choose which are red and white. You can get them from Megaspin. Some people think edge tape is just not necessary. This is because the table tennis racket is different from the badminton racket. The wooden handle does not slip, and so it makes very little significance if you stick the edge tape on the table tennis racket. Moreover, some players are thinking that if the racket is sticking with the edge tape, it will greatly increase the overall weight of the racket. They tend not to underestimate the weight. In the later stage of the game, you will feel the racket is getting more and more heavy, which will seriously affect the force of the forearm and wrist. This may cause you not able to play forehand and backhand stroke smoothly. You may also not be able to react to the shot come from the opponent quickly. In addition, the edge tape can make the wooden handle become thicker which will affect the grip and feel. For them, they would rather use a trowel and sandpaper for grinding if the racket does not fit in their hands instead of putting on edge tape.